From the Old Louisville Information Center building in Central Park, exit west onto Magnolia Avenue. Cross over Sixth Street and Magnolia Avenue. See area map. Many of the architects who live on neighboring St. Catherine Street (Limerick Tour) are setting up exhibits which illustrate some of the famous buildings they have designed in Louisville. Arthur Loomis, the architect of the just completed J. B. Speed Art Museum, is doing a special exhibit to explain the museum's construction. Dr. Board is inviting everyone to tour the sanitarium tomorrow as part of the day's activities. Let's go ahead of the crowd to view this interesting slate house from the outside. This structure, known as the "old slate house" was a medical facility from 1892 until 1916. In 1981 an architect purchased both 1412 and 1408 and rehabilitated them. Look across the street to see the Cabbage Patch Settlement House, established by Louise Marshall at this location in 1929 to provide opportunities and programs for inner-city residents, particularly young people. This western area of Old Louisville became known as Cabbage Patch because of the main crop grown by the many truck farmers. Dr. Board built this structure as his residence to match his sanitarium at 1412. The buildings were connected until 1978. It has a contemporary four level interior. One of the first houses on the block, it became rental property in 1889 and was returned to a single family dwelling in 1989. It is a good example of a modest middle-class, multiple-family dwelling of the Victorian Era. Rehabilitation has resulted in this home losing much of its historical definition. The front porch, with decorative spindles, remains one Victorian Characteristic. This is a fine example of a small Victorian dwelling with traditional design. In 1977, this property was condemned by the City to be scheduled for demolition. It was purchased for $2000 and renovated--a fine example of how badly deteriorated properties can be salvaged. This loft-bedroom residence was the carriage house for 618. It was converted from a mule barn. This dwelling has a three-façade bay window and terrace. In the early 1900s, 617 (now razed) and 618 housed the Southern Brick and Tile Company, which manufactured brick and drain tiles. Return to Sixth Street and turn north. Stop at Floral Terrace before continuing to Ormsby Avenue. Cross over Ormsby Avenue to find 1244 S. Sixth Street. This was the sight of Floral Park, a private park with its entrance off the alley on the north side of Park Avenue. Old Louisville has several residential courts like this. The scale and closeness of these homes give the appearance of an intimate community. As Mr. Cook was confined to a wheelchair, the house has wide doors, ramps, and a shower room. Notable in the basement is a double lap pool and auditorium for community forums. An old mural is on the wall, but it is not known if it is original to the house. No stairs were built leading from the first floor to the basement. The house also includes a safe where Mr. Cook's patents were kept. The main house replace one that was built in the 19th Century, which was destroyed by fire. The carriage house is original to that dwelling and still has some old horse rings. Cross over Sixth Street, then walk east along the north side of Ormsby Avenue. The building's entrance is framed by a pedimental door surround that features fluting , brackets and squared pilasters reminiscent of the Egyptian Revival style. Each dormer has a sunburst in the pilaster-supported pediment. This Structure, in scale and style, is considered one of the finest in Old Louisville. this was purchased in 1893 by James B. Speed. His wife, Hattie, built a music room for recitals and concerts. It connected the main house and the carriage house. "Miss Hattie" founded and built the Speed Art Museum in 1925. It has been reported by a recent owner that "Miss Hattie" returns each evening at eight o'clock, goes into one of the bathrooms and powders her nose. The house originally had 48 rooms and 20 fireplaces. It has been remodeled to suit the needs of business firm owners several times in recent years. Architecturally, it is one of the outstanding structures of Old Louisville. At the street edge, notice the stepping stone, once used for disembarking from carriages. See The J.B. Speed House, F&H Home Page for a detailed history and photograph. At the intersection of Garvin Place, turn north and continue to Oak Street, just beyond the Garvin Gate. The stone ornament near the roof is the structure's outstanding architectural feature. The gate was placed there by the Garvin Gate Block Association to create a buffer from the commercial corridor of Oak Street. Walk east along Oak Street to the front of 430 W. Oak, then return to Garvin Place and continue south to Ormsby Avenue. Henry S. Tyler, twice elected mayor of Louisville purchased the property in 1882. Ann Hassett, Executive director of the Landmarks Commission for the City of Louisville, rehabilitated the dwelling and has lived here since 1977. Major redecorating took place from 1891-1893, as evidenced by finding wallpaper under the wainscoting. Look north from this location and you will see the Old Louisville business district. Vernon D. Price, cider vinegar manufacturer. It has a three bay façade. Louvered shutters are found on the segmentally arched attic windows. Notice the formal perennial garden. The first floor has three eight-over-one windows flanked by arched multi-light French doors. All have stone keystones. The second floor has a single French door with an arched transom flanked by two sets of eight-over-eight segmentally-arched windows. The Victorian Porch with octagonal pillars supports a second floor balcony. Upon its completion, Mr. Casilly purchased the property for $2,100. At the corner of Garvin Place and Ormsby Avenue, you can view the Mayflower Apartment Building. From this point, cross over Ormsby Avenue, then turn east to continue the tour. In 1986, major renovation took place on this brick and terra-cotta, nine-story apartment building. Today, it has 97 units. President Truman is among the many famous visitors who have stayed here. The decorative cornice has brackets and terra-cotta panels. Notice the stone turret on the east bay of the second floor. The peculiar spacing of the stones is called rusticated banding, and is the building's outstanding architectural feature. Notice the orange colored brick and the diversity of decorative carving. There are cherubs above the second-floor windows, shells above the third floor windows, and faces over the main door. The Brown Distillery is still in business today in Lawrenceburg, Kentucky. At the Fourth Street Intersection, you can view the Puritan Apartments before turning south along Fourth Street. Originally the very prominent Puritan Hotel, additions were made in 1925 and 1957. During the 1950s, apartments rented for $700 and $800 a month. In 1976, the Kentucky State AFL-CIO and affiliates purchased and remodeled the building to rent apartments to its retired and disabled members and to others who qualify for residency. For directions, stop at the information desk between 8 AM and 4 PM, Monday-Friday. A restaurant is open from 11 AM to 6 PM seven days a week. 1322, 1328 and 1332 S. Fourth Street were built by Mason Maury, one of Kentucky's leading architects. When 1328 and 1332 were first built, they were reported to be the most beautiful houses in Louisville. Mason Maury described this house for an architectural magazine as a "three story residence, 37 by 70 feet; pressed brick, stone trimmings, slate roof, hardwood finish and tiling, mantels, dumbwaiters, electric bells and speaking tubes, stained glass closets and bath, steam heat." It cost $13,000 to build. It is now owned by the woman's club of Louisville and is available for receptions (call 634-9437). The Old Louisville Children's Center (daycare) operates in the rear carriage house. You may walk back to this ornate structure for better viewing. Notice the sculpted dog and horse heads above the door. There is a tower with columnar loggia on the left side of the façade. Exquisite carvings in the gable and foliage enliven the corners of the massive porch, which has squat Romanesque columns. Note the chimney in the window on the park side and the large balcony in the rear of the house. Also notice the seashell effect on the rounded window on the south side. Now the Inn at the Park. 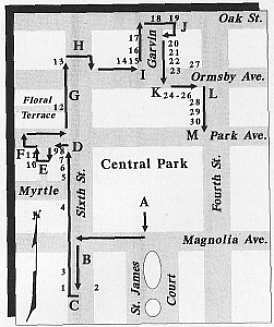 The tour ends at the intersection of Fourth Street and Park Avenue, at the northeast corner of Central Park.